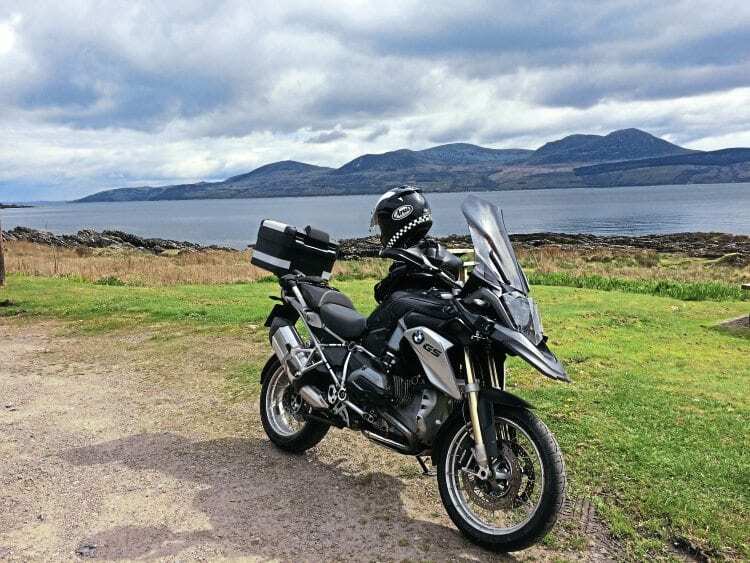 Two day rides in one trip – Dumfries and Galloway up to Kintyre plus Glencoe. Sometimes the best bike trips are those where you pretty much go on the spur of the moment. Finding I had a spare day or two, I dug out the map, looked for roads marked as scenic and chose a destination. My starting point was simple enough. The destination had to be new, the roads entertaining and the terrain varied. 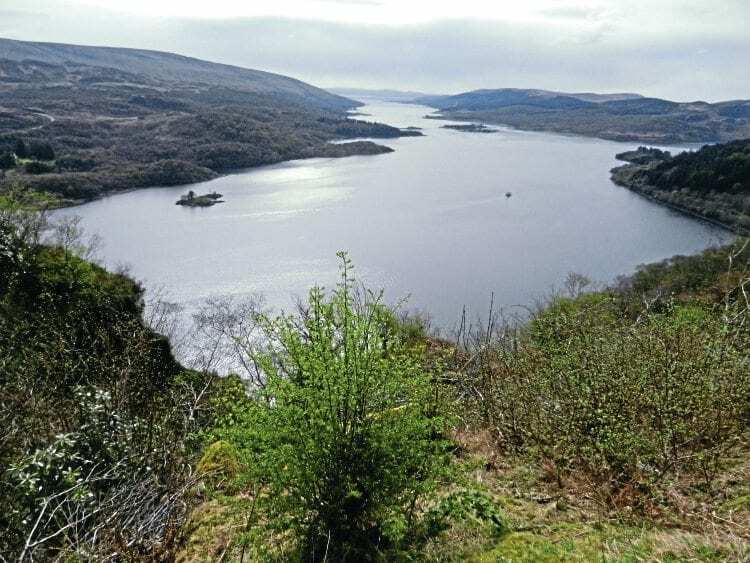 I chose the Kintyre peninsula west of Glasgow in Argyll and Bute. 2013 GS romped the trip, but heated grips could do with more oomph. For me, one of the reasons Scotland is such a great biking location is that there are always new places (and roads) to discover. The main A roads can be fantastic – fast flowing, often spectacular – but it’s the minor A and B roads where I find the real adventure begins. The weather can be a stumbling block, and in late April the forecast was for a return to winter with frosts overnight and snow on the hills. Still, at least it was dry and if in doubt I always revert to the golden rule of bike trips – just go. I live in the North Midlands so, with the time available, there was nothing for it but a bit of motorway mile munching to get me to the border as quickly as possible. I bought my 2013 BMW GS second-hand, and it’s the TE model with cruise control, which was great for the M6 50mph variable speed stretches, though I found the drop in revs a little nerve-racking when reacting to the random, lane-changing antics of bored sales reps. Oh, and with temperatures in the low single figures, the heated grips were a bit underwhelming too. After a couple of hours I was in Scotland and immediately left the motorway, heading for Dumfries. 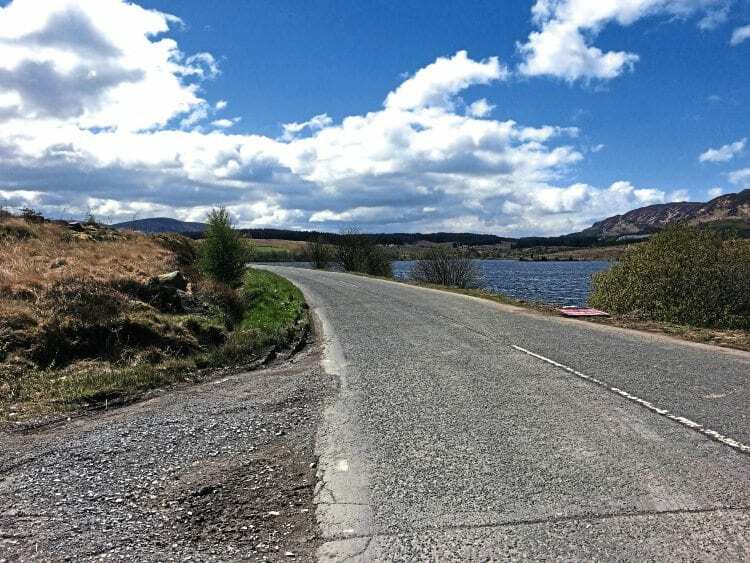 The A75 felt great after the M6 monotony (although the safety camera vans were out) but the real fun came when I joined the minor roads into the Galloway forest. The A712 and A714 via Newton Stewart to Girvan are great biking roads. The terrain is constantly changing with flowing corners and open country either side. Traffic was sparse and the big GS was in its element. With the engine mode in dynamic, progress was fast but not furious. It was more a waltz of counter-steering calm, not even upset by late braking on gravelly corners. It was so stable that I actually began to miss a bit of leaning off the bike, but the GS frowns at such uncouth behaviour. Pause to gaze at Ailsa Craig. 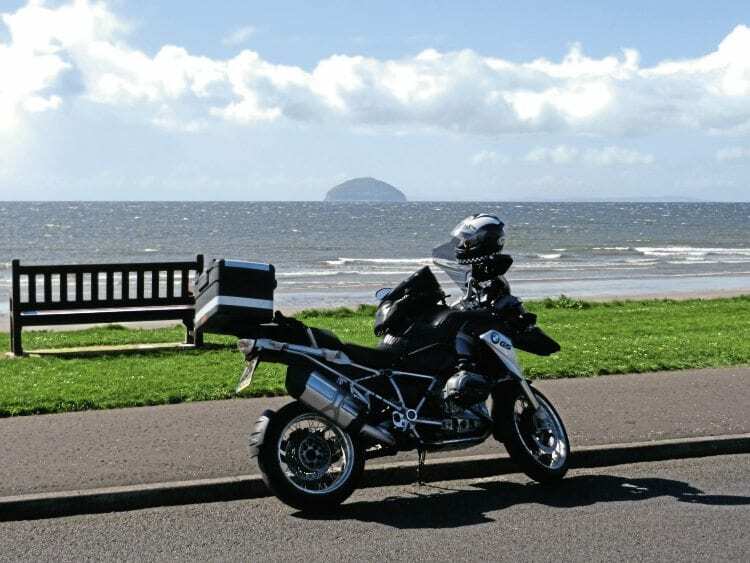 When I arrived at Girvan on the coast the sun was out and I stopped for a break, looking out to sea to Ailsa Craig. I was stopping overnight at Irvine so made my way up the coastal roads past Turnberry – the golf course is now ‘Trump Turnberry. Driving past the resort it’s easy to imagine a mop-haired motorcade parked outside the impressive hotel. The road here is busier and slower but that gives you the chance to enjoy the views. 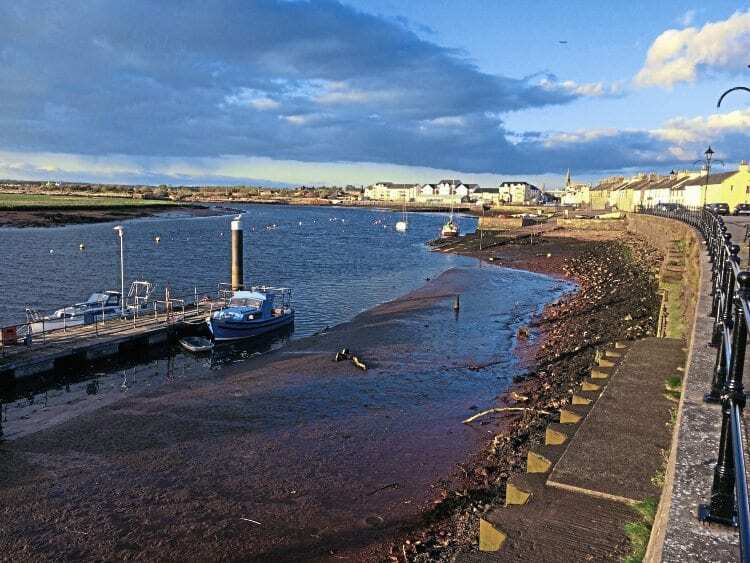 I arrived in Irvine in early evening and had a very pleasant walk and a few pints on the harbourside. Day two, I continued up the coast road via Largs to catch a ferry from Gourock, heading for Dunoon on the Argyll and Bute peninsula. The ferries run backwards and forwards every 20 minutes, and for me, there’s something special about taking the bike across water – it makes for more of an adventure. Off the other side, I took the single-track road (the B836) across the peninsula, which feels like far away farming and fishing country despite being only an hour or two’s drive from Glasgow. The single-track road is narrow but well surfaced so the only thing to watch out for is the occasional van, or getting distracted by the scenery. Harbourside at Irvine, late afternoon. Another ferry from Portavadie took me to Kintyre, passing salmon farms on the water. Gannets dive-bombed either side and dolphins swam by in the distance. Kintyre has one major road (the A83) and one minor (B842) that complete a loop of the peninsula via Campbeltown in the south. The B road gently meanders from bay to bay down the east coast with spectacular views to Arran. The A road is faster, and allowed the GS to stretch her legs again. Although you can pick up the pace in places, you won’t want to, because the views are just too good (make sure you take your binoculars). Put this one on your bucket list – A82 through Glencoe. From Kintyre I carried on up the A83 to Lochgilphead and into Oban. I still had a few hours of light before dusk, so headed up to Glencoe. 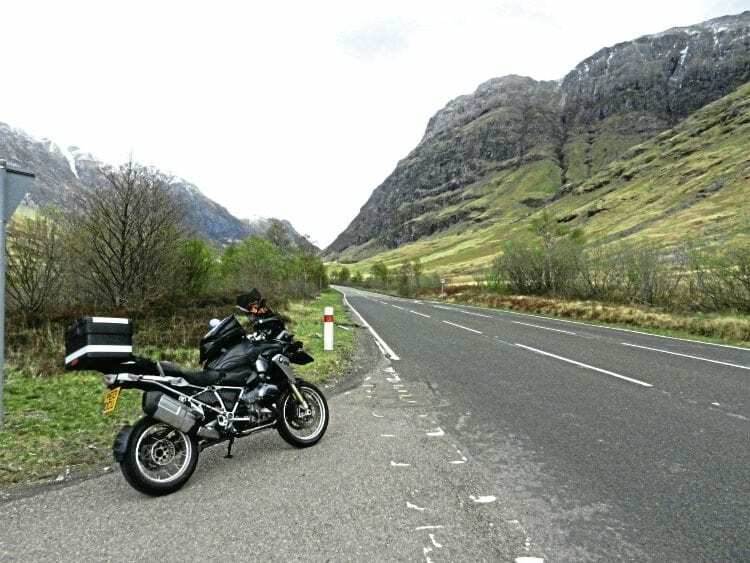 The A82 probably features somewhere on every biker’s Scottish itinerary. Fast flowing and dramatic, if you catch it right (early morning/early evening) and avoid the campervans, you’re in for treat. Later, I took the Glen Orchy road to Inverlochy which by contrast is a tranquil back route following the river. It’s the perfect anecdote to the sensory overload of Glencoe. Next day it was time to head south, though I was able to take in the A819 to Inveraray and the A83, both of them must-ride roads. Despite its size, the GS is happy being hustled into and out of ever-changing bends and it felt like I was close to touching down on some corners, but a look at the edges of the tyres showed there was much more lean possible. I was the limiting factor – not the bike. 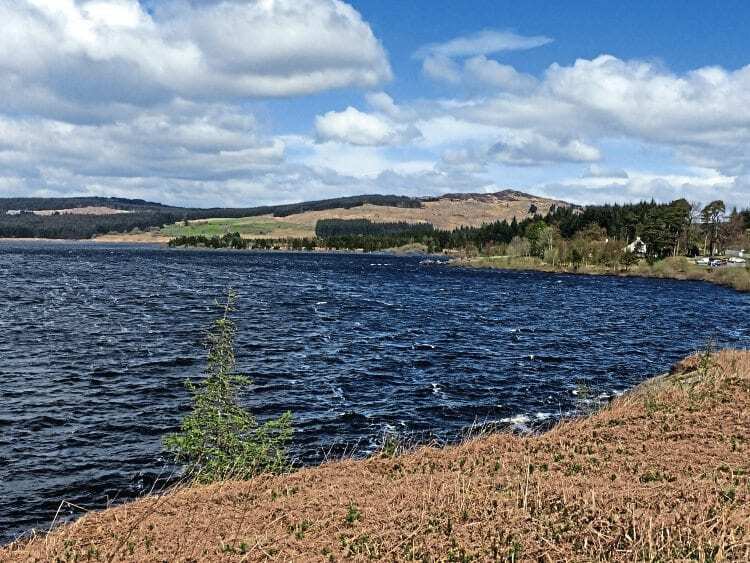 Southwest Scotland is beautiful too – this is Galloway. Then it was A814 back to the motorway, past the naval base at Faslane (complete with anti-nuclear protest camp) and over the Erskine Bridge for 300 miles of motorway home. With the sun out, heated grips on level 2, screen raised and cruise control on, this was no hardship. The GS had lapped up just over 900 miles in three days, but you could do this trip on any bike. I had ridden some of the finest biking roads in the UK across spectacular terrain and all within a day’s ride of home, though I was lucky with the weather. Best of all though, it only took a couple of hours to plan and pack. So there are no excuses – next time you have a couple of spare days, consider Kintyre. But don’t think about it too much – just go. 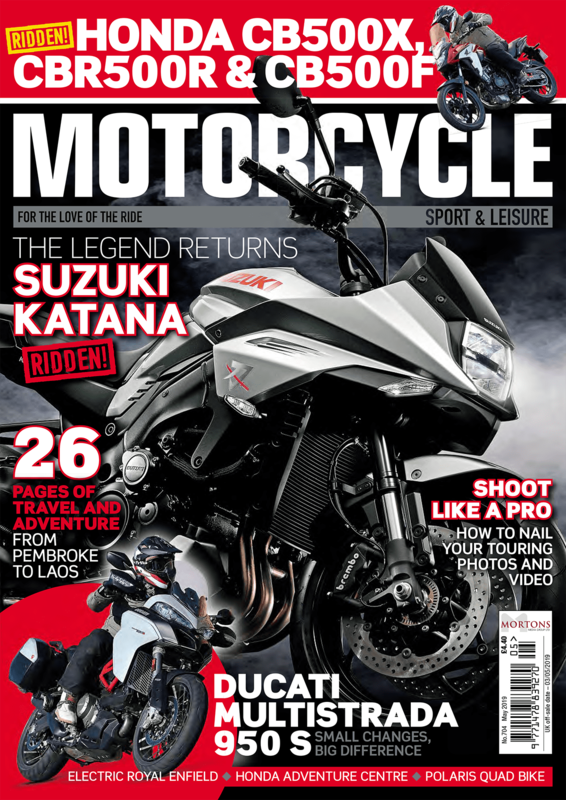 Next Post:9 Christmas gift ideas for a motorcyclist!